Eva Pareyn has taught for a decade the course 'Posture and Movement' at the Royal Conservatory of Brussels (Koninklijk Conservatorium Brussel). She is fascinated by the story a body is telling and she is fascinated by and committed to awakening the potential locked in each person through their own self-development, and her private practice for “Body Mind Coaching&rdqo; and Osteopathy, also in Brussels, has a central role in her life. 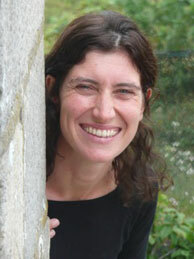 Eva has also been an active professional musician for 10 years, playing double bass in different orchestras in Belgium. Eva studied Physiotherapy at the University of Leuven, and, during her career as musician, she also studied 5 years "Body Mind Medicine" based on Taoism and Coaching. Then, she completed her studies with osteopathy at the Flanders International College of Osteopathy. In the crossing of all this studies and disciplines, she found a merging point between eastern philosophy and western life style.